Benjamin is a Lecturer (Assistant Prof., tenured) in Design Informatics and Visualization at the University of Edinburgh. His research designs and investigates interactive information visualization interfaces to help people explore, communicate, and understand data. Before joining the University of Edinburgh in 2017, Benjamin worked as a postdoc at Harvard University (Visual Computing Group), Monash University, as well as the Microsoft-Research Inria Joint Centre. Benjamin was visiting researcher at the University of Washington and Microsoft Research in 2015. 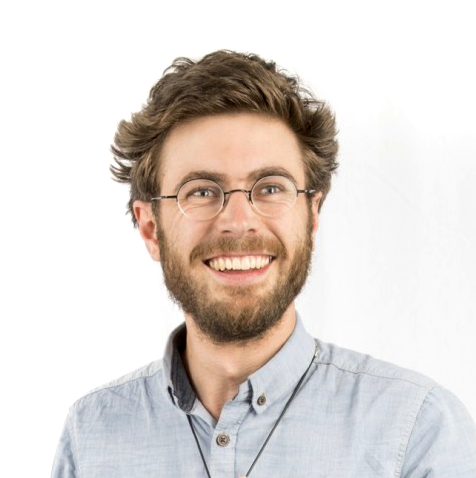 He obtained his PhD in 2014 from the Université Paris Sud where he worked at the Aviz Group at Inria. The PhD thesis entitled Connections, Changes, and Cubes: Unfolding Dynamic Networks for Visual Exploration got awarded an honorable mention as the Best Thesis by the IEEE Visualization Committee. Web and visualization developer / designer. Summer internship in interactive network visualization with Vistorian.net (May-July). Summer research internship on visualization tools (May-July). PhD in data visualization. Contact me directly. Information on funding here. March 2019: Invited talk at Edinburgh Data Tech on Tools for Data Visualization. Thanks for the organizing and having me. Feb 2019: New research on Visualizing Peace and Conflict got funded. If interested in working with us (postdoc, intern, freelance, .. ), email me. Jan 2019: VisGuides, a forum for data visualization and guidelines gets online. Join our community. Jan 2019: 2 papers, 1 case study, 1 poster, and 1 workshop accepted at CHI in Glasgow. See you there and find details just below. Nov 2018: Katie Quinn’s data comic win the Scottish Communicating Analysis Award. Congrats everyone! Vistorian.net: Interactive Visualizations for Dynamic and Multivariate Networks. Free, online, and open source. More information on the Vistorian-blog. To support the project and help us securing funding, please cite our paper when using the Vistorian (thanks!). Datacomics.net: Collection and platform for data-driven storytelling with data comics. Personal collection of tools and visualization collections. DataOnCurves.wordpress.com: Collection of visualizations based on curves and lines. Maxime Cordeil, Andrew Cunningham, Benjamin Bach, Christophe Hurter, Bruce H. Thomas, Kim Mariott, Tim Dwyer”IATK: An Immersive Analytics Toolkit” IEEE VR (2019) . Lucy Havens, Mengting Bao, Larissa Pschetz, Benjamin Bach, Christine Bell.”PaxVis: Visualizing Peace Agreements” ACM Conference on Human Factors in Computing Systems (CHI) [Poster] (2019). Zezong Wang, Shunming Wang, Matteo Farinella, Dave Murray-Rust, Nathalie Henry Riche. “Comparing Effectiveness and Engagement of Data Comics and Infographics” ACM Conference on Human Factors in Computing Systems (CHI) (2019). Nam Wook Kim, Nathalie Henry Riche, Benjamin Bach, Guanpeng Xu, Matthew Brehmer, Ken Hinckley, Michel Pahud, Haijun Xia, Michael J. McGuffin, Hanspeter Pfister. “DataToon: Drawing Data Comics About DynamicNetworks with Pen + Touch Interaction” ACM Conference on Human Factors in Computing Systems (CHI) (2019). Zezhong Wang, Harvey Dingwal, Benjamin Bach. “Teaching Data Visualization and Storytelling with Data Comic Workshops” ACM Conference on Human Factors in Computing Systems (CHI), Extended Abstracts (2019). Sicat, Ronell, Jiabao Li, JunYoung Choi, Maxime Cordeil, Won-Ki Jeong, Benjamin Bach, and Hanspeter Pfister. “DXR: A Toolkit for Building Immersive Data Visualizations.” IEEE transactions on visualization and computer graphics (2019). McCormack, Jon, Jonathan C. Roberts, Benjamin Bach, Carla Dal Sasso Freitas, Takayuki Itoh, Christophe Hurter, and Kim Marriott. “Multisensory immersive analytics.” In Immersive Analytics, pp. 57-94. Springer, Cham, 2018. Borgo, Rita, L. Micallef, B. Bach, F. McGee, and B. Lee. “Information Visualization Evaluation Using Crowdsourcing.” In Computer Graphics Forum, vol. 37, no. 3, pp. 573-595. 2018. Bach, Benjamin, Charles Perin, Qiuyuan Ren, and Pierre Dragicevic. “Ways of Visualizing Data on Curves.” In TransImage 2018-5th Biennial Transdisciplinary Imaging Conference, pp. 1-14. 2018. Bach, Benjamin, Moritz Stefaner, Jeremy Boy, Steven Drucker, Lyn Bartram, Jo Wood, Paolo Ciuccarelli, Yuri Engelhardt, Ulrike Koeppen, and Barbara Tversky. “Narrative Design Patterns for Data-Driven Storytelling.” In Data-Driven Storytelling, pp. 125-152. AK Peters/CRC Press, 2018. Diehl, Alexandra, Alfie Abdul-Rahman, Mennatallah El-Assady, Benjamin Bach, Daniel Keim, and Min Chen. “VisGuides: A forum for discussing visualization guidelines.” (2018). Lekschas, Fritz, Michael Behrisch, Benjamin Bach, Peter Kerpedjiev, Nils Gehlenborg, and Hanspeter Pfister. “Pattern-Driven Navigation in 2D Multiscale Visual Spaces with Scalable Insets.” bioRxiv(2018): 301036. Hullman, Jessica, and Benjamin Bach. “Picturing Science: Design Patterns in Graphical Abstracts.” International Conference on Theory and Application of Diagrams. Springer, Cham, 2018. Romat, Hugo, Caroline Appert, Benjamin Bach, Nathalie Henry-Riche, and Emmanuel Pietriga. “Animated Edge Textures in Node-Link Diagrams: a Design Space and Initial Evaluation.” In Proceedings of the 2018 CHI Conference on Human Factors in Computing Systems, p. 187. ACM, 2018. Bach, Benjamin, Zezhong Wang, Matteo Farinella, Dave Murray-Rust, and Nathalie Henry Riche. “Design patterns for data comics.” In Proceedings of the 2018 CHI Conference on Human Factors in Computing Systems, p. 38. ACM, 2018. Kim, Nam Wook, Benjamin Bach, Hyejin Im, Sasha Schriber, Markus Gross, and Hanspeter Pfister. “Visualizing Nonlinear Narratives with Story Curves.” IEEE Transactions on Visualization & Computer Graphics 1 (2018): 1-1. Bach, Benjamin, Ronell Sicat, Johanna Beyer, Maxime Cordeil, and Hanspeter Pfister. “The Hologram in My Hand: How Effective is Interactive Exploration of 3D Visualizations in Immersive Tangible Augmented Reality?.” IEEE Transactions on Visualization & Computer Graphics 1 (2018): 1-1. Lekschas, Fritz, Benjamin Bach, Peter Kerpedjiev, Nils Gehlenborg, and Hanspeter Pfister. “HiPiler: visual exploration of large genome interaction matrices with interactive small multiples.” IEEE transactions on visualization and computer graphics 24, no. 1 (2018): 522-531. December 2018: Visualizing Space-Time Cubes in AR, Shonan Seminar to Immersive Analytics, Tokio. September 2018: Perspectives on Data Visualization, Design Informatics Seminar Series, University of Edinburgh. Master: Finn Ickler (MSc, 2018), Xudong Jiang (MSc, 2018), Ilyas Zholdasbayev (MSc, 2018), Yiwei Sun (MSc, 2018), Yan Wu (MSc, 2018), Iqbal Rosiadi (MSc, 2018), Edson Alcala (MSc, 2017), Parul Sharma (MSc dissertation, 2017), Ruobing Hao (MA, 2017), Xian Tang (MSc, 2017), Zezhong Wang (MSc, 2017).